The Brangelina split has managed to shock and entertain several people. 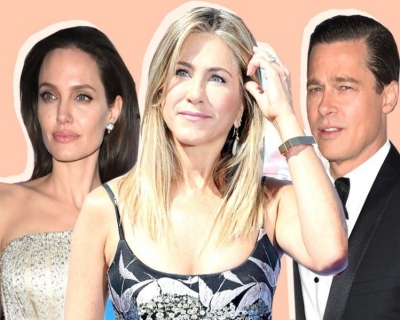 “Brangelina” attained a status unmatched by celebrity couples in the past. Even as we obsess over celebrities, unfortunate incidents like the Brangelina split seem to bring out the worst in us. This misdirected focus means things that should reach out – like the humanitarian causes taken up by Angelina Jolie and Brad Pitt – go right over our head. Supercouples had happened before (Bennifer, TomKat) but the attention garnered by Brangelina was unprecedented and rose to the level of insanity. It was dramatically different from, and way more than the sum of the hypes they individually attracted. As had happened before, the team of two was able to knock off one another’s negative publicity. Media and public played along, and soon enough, Brangelina was worshipped as a single entity. Each of them was an icon and their off-screen chemistry appealed to the public which formed a perception of completeness in knowing them as Brangelina. Of course, there was double the excitement! They were able to channelize the causes they cared about as a team – and bring attention to issues that needed attention. This wasn’t a brand that sought to be the centre of attention, but one that used fame to spread awareness on problems that mattered. In doing so, they earned a respectable image. But Brangelina was insufficient for the media and public who just had to cover every conceivable angle to give and get a popular story. This was proved yet again when news of their split made rounds. One did not know whether to shudder at the malice on social media or pity the perpetrators. Why was our response to the split gross? People, in the name of sympathy, end up leeching on another’s life to provide the much-desired distraction from their own. This was reflected in the way people teemed in “support” of Aniston more than a decade ago. They are also obsessed with making the split their moment of fame at any cost. This was reflected in the widely-circulated memes of what Aniston’s response to the split would be. And this after an eleven-year-old divorce from Pitt! People who saw humor in the memes laughed and went their way. But the way Aniston was portrayed – as a desperate loner whose sole reason for living was this moment – was a shocking insult. If with this split, people finally stop pulling wool over their eyes and bury the “poor Jen” narrative once and for all, it would be a long-pending step. When should we question our sense of focus? Jolie, moved by the devastation in Cambodia, contacted the UN High Commissioner for Refugees on her return from shooting in 2001. She personally visited refugee camps to understand the situation better and made tremendous effort to reach out – financially and as an activist spreading awareness. Her sincerity and effort earned her a Goodwill Ambassador title from UNHCR. She went on 40 missions in the next decade and shared experiences. She aimed to visit “forgotten emergencies” which had lost media’s focus. She took flying lessons to ferry aid workers across the world. Her efforts in conservation and community development led her foundation (Maddox Jolie-Pitt Foundation) to create Asia’s first Millennium village that aimed to implement UN development goals. Huge animal conservation projects and a free health clinic, housing, and a school for the San Bushmen community at Naankuse have been funded by Jolie and Pitt in the name of their daughter. She has also actively championed the cause of child immigrants and vulnerable children, advocated for children’s education and financially contributed to efforts in this direction, funded health facilities for children. She has taken up the issue of human rights, women’s rights. Jolie Legal Fellows - a network of lawyers and attorneys who are sponsored to advocate the development of human rights in their countries – of the Jolie Legal Fellowship she established, have advocated child protection efforts in Haiti after the 2010 earthquake and encouraged the development of a democratic inclusive process in Libya following the 2011 Revolution. Pitt has been involved in bringing about awareness and funding sustainable housing. His Make It Right foundation organized housing professionals in New Orleans to finance and construct 150 sustainable, affordable new houses in New Orleans's following the destruction wrought by hurricane Katrina. One can go on talking of their humanitarian contribution – especially Jolie’s – but the point is these efforts do not get the attention of a gossip-obsessed society which prefers to focus on the break-up of Brangelina and the media which shapes and caters to public demand. Where does our obsession become absurd? People want them to stay together so they can get their “happily ever after” story that can keep them enchanted. We forget that Jolie and Pitt are not movie characters but real people. Our craving for good gossip and obsession with the mundane moments of celebrities’ daily lives delude us into making them a part of our personal package. So when Brangelina breaks, it’s taken as a personal blow. What we don’t want to understand is this phase is harder on the two individuals and their children. Media and public will always entertain and be entertained/add to the fun, irrespective of Brangelina. But at this stage, their appeal for privacy must be respected. Who highlighted a key problem with excessive undeserved coverage? 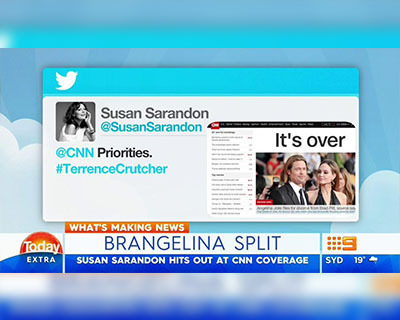 Susan Sarandon expressed displeasure with CNN’s coverage of the Brangelina split. The points she made pertain to most media outlets. In a tweet at CNN, the actress screenshotted its homepage and added her message – “Priorities. #TerrenceCrutcher”. Terrence was a 40-year-old black man, fatally shot by the police on September 16, 2016 in Tulsa, Oklahoma. The incident was captured on video and showed him waiting for help with his broken-down car. His death is being probed. Sarandon rightly said the news was being pushed to the background to make room for the Brangelina split. CNN and other internationally reputed media outlets are looked upon as reliable sources for news that needs attention, not for celebrity updates. The argument that there are several news outlets to look up for relevant information doesn’t hold water when most are competing to provide variants of the same incident. It neither makes any one of the respected outlets less accountable somehow. How do media play a role? Just as Brangelina stopped trending, news makes rounds on how Pitt has responded to the divorce and what his ex-wife said of his divorce. Just as the Internet serves as a platform for meaningful messages to reach a wide audience, it also sustains and re-ignites conversations that could have died out sooner in the past. This dual nature accommodates speculations, wild rumors and gossips that increase each time they’re passed around. Apart from being a waste of resource, this also jeopardizes lives of the subjects of gossip, or at the least invades their privacy. 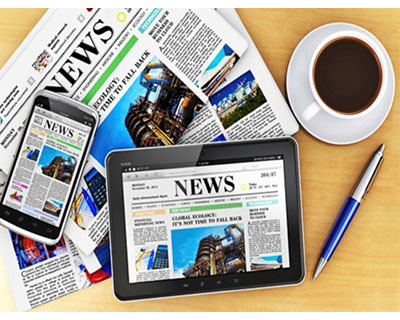 Media play a huge role in shaping a public figure’s image – they paint the defining strokes. As the media reasons, it’s a job that needs to be done. The endless supply of misinformation, gossip and sensational build ups cannot happen without significant public demand. People just can’t get enough of the lives of those they idolize and in most cases movie stars are obliged to allow the scrutiny. Again, media is a broad-ranging term and different outlets cater to a different audience. But some restraint should be practiced when lives of individuals – even if they are superstars on-screen – are involved.